Reading and share top 5 famous quotes and sayings about Cowgirls by famous authors and people. Browse top 5 famous quotes and sayings about Cowgirls by most favorite authors. 1. "Most cowgirls are natural storytellers, their art honed by years of practice. . . . It serves as entertainment; it also preserves the humor and value of a unique way of life." 2. 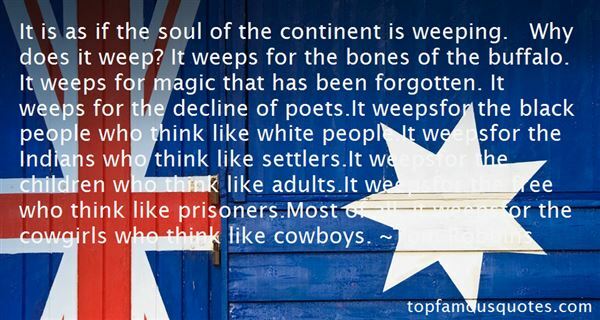 "It is as if the soul of the continent is weeping. Why does it weep? It weeps for the bones of the buffalo. It weeps for magic that has been forgotten. It weeps for the decline of poets.It weepsfor the black people who think like white people.It weepsfor the Indians who think like settlers.It weepsfor the children who think like adults.It weepsfor the free who think like prisoners.Most of all, it weepsfor the cowgirls who think like cowboys." 3. "A little boy, he can play like he's a fireman or a cop--although fewer and fewer are pretending to be cops, thank God--or a deep-sea diver or a quarterback or a spaceman or a rock 'n roll star or a cowboy, or anything else glamorous and exciting (Author's note: What about a novelist, Jellybean? ), and although chances are by the time he's in high school he'll get channeled into safer, duller ambitions, the great truth is, he can be any of those things, realize any of those fantasies, if he has the strength, nerve and sincere desire...But little girls? Podner, you know that story as well as me. Give 'em doll babies, tea sets and toy stoves. And if they show a hankering for more bodacious playthings, call 'em tomboy, humor 'em for a few years and then slip 'em the bad news...And the reality is, we got about as much chance of growing up to be cowgirls as Eskimos have got being vegetarians." 4. 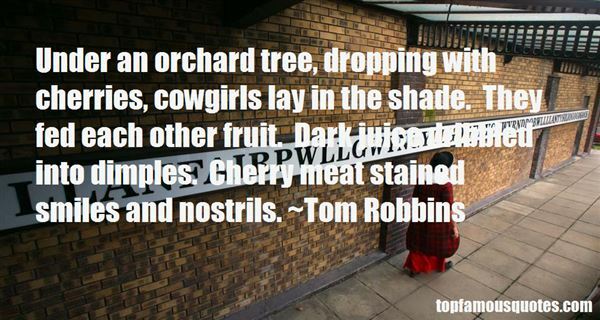 "Under an orchard tree, dropping with cherries, cowgirls lay in the shade. They fed each other fruit. Dark juice dribbled into dimples. Cherry meat stained smiles and nostrils." 5. "Personally, I prefer Stevie Wonder," confessed the Chink, "but what the hell. 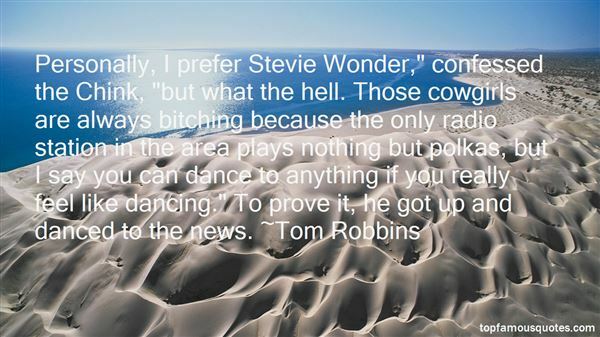 Those cowgirls are always bitching because the only radio station in the area plays nothing but polkas, but I say you can dance to anything if you really feel like dancing." To prove it, he got up and danced to the news." I generally make a sort of playlist for my iPod for whatever project I'm doing."